The event will feature performances from Decca signees Fieh, Jess Gillam, J.S. Ondara and Imelda May as well as a speech from Decca President Rebecca Allen. Since its formation in 1929, Decca has served as the official label partner to three royal weddings, the Queen’s Diamond Jubilee and the 2012 Olympics and has been home to an array of legendary musicians. Throughout 2019, the label will be celebrating its nine decades. The first Friday of every month will be a ‘Decca Day’ with 90 physical and digital releases capturing the spirit of the label. It will also mark Record Store Day 2019 with a series of exclusive vinyl releases. The V&A and Decca’s hidden West Hampstead studios will open their doors in the Summer to mark the 90 years with a range of activities, from one-off performances to exhibitions. 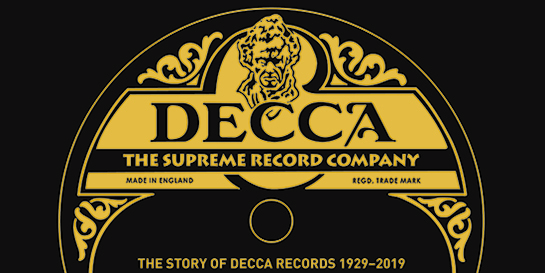 Decca are also uncovering their history with a book - ‘The Supreme Record Company: The Story Of Decca Records’ - two programmes on BBC Radio 2 that chart 20 of the most iconic Decca recordings and 45 special 90-second podcasts on www.decca90.com. Some of Decca’s distinguished artists are also reaching major milestones this year: Renée Fleming approaches 25 years on Decca; Cecilia Bartoli reaches 30 years; and Riccardo Chailly celebrates 40 years. Revealing more of the story behind some of their most prestigious artists, 2019 will also see the release of a Pavarotti feature film and six rare and restored David Bowie videos. Decca president Rebecca Allen says. “Decca Records has been the soundtrack to many historical and cultural moments, a truly unique brand with a truly unique identity. Last year alone, the label had number one albums with Rod Stewart and Andrea Bocelli, helped teenage cellist Sheku Kanneh-Mason sell 100,000 albums worldwide and saw Jeff Goldblum top the UK jazz charts with his debut record.